Researchers in the NDSU Department of Coatings and Polymeric Materials (CPM) have discovered enamine resins which are the reaction products of an acetoacetatylated resin, and a C1-C20 alkyl amine or a mixture of C1-C20 alkyl amines. The acetoacetylated resin is the reaction product of a polyol having 4 or more hydroxyl groups; and at least one acetoacetate. 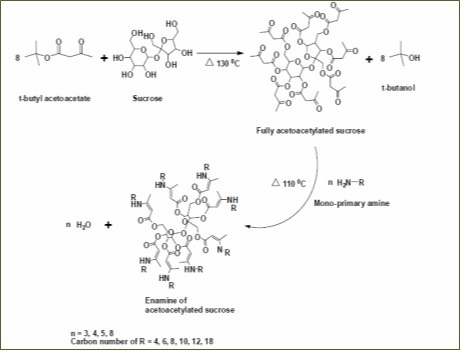 The invention also relates to an acetoacetylated resin which is the reaction product of a polyol having 4 or more hydroxyl groups and at least one acetoacetate, where a portion of the hydroxyl groups of the polyol are replaced by acetoacetate groups and the remaining hydroxyl groups are replaced by a saturated monofunctional carboxylic acid ester, unsaturated monofunctional carboxylic acid ester, or a mixture thereof; as well as to enamine resins prepared from these acetoacetylated resins. The invention has curable coating compositions which may be formulated with or without solvents. A curable coating composition of the invention contains a resin such as those discussed above or a mixture of those resins, at least one metallic drier compound; and optionally one or more solvents. This technology is the subject of issued US Patent No. 9,567,422 and is available for licensing/partnering opportunities.